Remington Premier High Velocity Magnum Turkey 12 Gauge Ammo 3 1/2" 2oz #4 Shot Copper Plated Lead ammo for sale online at cheap discount prices with free shipping available on bulk 12 Gauge ammunition only at our online store TargetSportsUSA.com. Target Sports USA carries the entire line of Remington ammunition for sale online with free shipping on bulk ammo including this Remington Premier High Velocity Magnum Turkey 12 Gauge Ammo 3 1/2" 2oz #4 Shot Copper Plated Lead. Remington Premier High Velocity Magnum Turkey 12 Gauge Ammo 3 1/2" 2oz #4 Shot Copper Plated Lead ammo review offers the following information; Remington Premier High Velocity Magnum Turkey 12 Gauge 3-1/2" ammo feature 2 oz #4 Shot Copper Plated Lead bullets. Remington Ammunition presents the shooter with an extensive variety of premium bullet developed to combine with the strict manufacturing tolerances to create ammo with which any shooter would be willing to take the perfect shot. With a muzzle velocity of 1300 feet per second making the Remington Premier High Velocity Magnum Turkey 12 Gauge an outstanding choice for turkey hunting ammo. 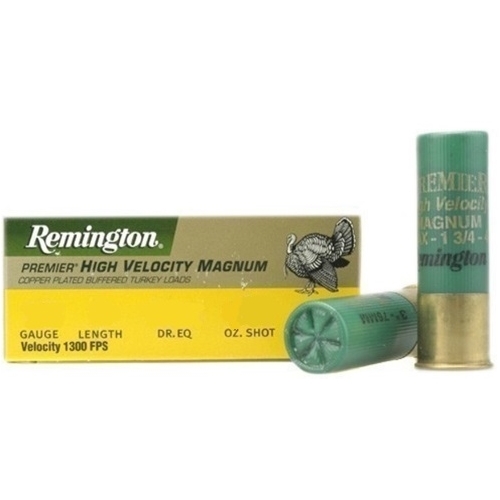 Remington Premier High Velocity Magnum Turkey 12 Gauge ammo is new production, non corrosive ammo designed to feature brass casing and Boxer primers. This Remington ammo is reloadable for those high volume shooters who love to reload their 12 Gauge ammo. Remington High Velocity Magnum ammo is packaged in boxes of 10 rounds and cases of 250 rounds. Free shipping is available on bulk orders of this Remington 12 Gauge ammo from Target Sports USA. Remington ammo was always a high quality brand. I originally used Nitro magnums however now with a new 3 1/2 inch barrel I switched to these rounds. As always REMINGTON DID NOT DISAPOINT.